Gluten free baking is hard enough to master with all the funky ingredients and weird sounding names. I never even heard of xanthan gum before until now. Having the right kitchen tools makes it a lot easier. One of the cheapest and most helpful gluten free products you can have is parchment paper. Without it, baking can be a struggle. Â You need Parchment Paper! I use parchment paper on nearly everything that I bake! Do you have old cookie sheets that look like they’ve been sitting outside for a week! Don’t throw them out! Just cover them with parchment paper instead. 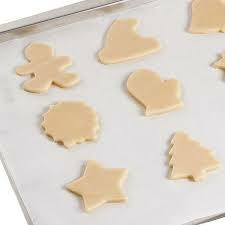 I have at least two cookie sheets that look just like that and they perform very well when I use parchment paper. You can buy it at the store in a role like foil or plastic wrap, or you can buy it cut up into flat sheets. I buy the flat sheets because the edges do not curl up on me. They usually come in packs of 100 sheets. Don’t throw them away after you have used them once. Re-use them until you tear a hole in it or it looks so ratty that you would be afraid to show your mother what you bake on. They keep going and going. the ultimate “green” kitchen paper! You can also shake off any burned on bits or sugar that are left from baking. Just pick it up and shake it over the sink. Everything should slide right off. Use it to roll out cookies on, bake biscuits on, place your dinner casserole on so it doesn’t make a mess in your oven. Roll out your pie crusts between two sheets of parchment. Pull off the top sheet and gently flip over for pie crust to place in your pie pan. For crackers, If the recipe says to remove the crackers to your baking pan, don’t! Just pull off the top sheet, cut up your crackers and slide the dough still on the bottom sheet onto your baking pan and bake right on the parchment. It is the ultimate in non-stick surfaces.